How do I know if my company or my ISP is using a TLS proxy? If your company has set up the proxy correctly you won't know anything is off because they'll have arranged to have the proxy's internal SSL certificate registered on your machine as a valid certificate. If not, you'll receive a pop-up error message, which, if you click on to continue, will accept the "fake" digital certificate. In either case, you get a secure connection to the proxy, it gets a secure connection to the outside site -- and everything sent over the proxy can be read in plain text. Whoops. So if I understood correctly all my private information like banking credentials, Facebook, mail etc. can be easily intercepted without me even knowing about it. If that is true how may I know whether my company or my ISP has a proxy in place and is eavesdropping on all my sensitive data? As the post you linked to explains, the proxy will decrypt all the traffic, and then encrypt it again but signed with another certificate. Therefore the certificate you receive will be different from the one the website send. So one way to detect this is to compare the certificates you get when you visit a website from your company network with the one you get when you visit it from outside of that network (e.g. from home). All browsers have functionality to view the thumbprint of a certificate. In Chrome, click the green lock in the URL bar, then click "Info", and finally "View certificate". Some websites may serve different certificates to different users for various reasons, so that they don't match for one site might not be enough to conclude there is a TLS proxy. The proxy might not intercept traffic for all domains, so even if all the certificates you try match it is impossible to know that your traffic will never be intercepted. So how do you get around those caveats? You would have to go through the trust store in your OS and your browser (if it uses it's own) to see if any certificates have been added there. For instructions on how to do this, see this question. Finally, it should be noted that TSL interception is a perfectly legitimate thing for an employer to do. And since you are probably using a computer provided to you by your employer at work, there are many other ways they could monitor your browsing habits and anything else you do on your computer without relying on a proxy server. So if you want privacy, don't use your work computer or network. But what about the ISP? If your company has set up the proxy correctly you won't know anything is off because they'll have arranged to have the proxy's internal SSL certificate registered on your machine as a valid certificate. If not, you'll receive a pop-up error message, which, if you click on to continue, will accept the "fake" digital certificate. Since your ISP does not control your computer, there is no way for them to install a root certificate (other than making you do it). So you would get a warning that the certificate is incorrect every time you visit a site over HTTPS. Not very stealthy in other words. If you are still concerned someone might have sneaked a root certificate into your trust store, you could used the method above to check. But you would need to compare the certificates you get from the ones from a computer with another ISP, preferably even in another country. Or you could just compare them to the preloaded public key pins for sites that use HPKP. Not the answer you're looking for? Browse other questions tagged tls proxy or ask your own question. Can my employer see what I do on the internet when I am connected to the company network? I can't access websites that use HTTPS, instead getting the message “your connection is not private”! How can you check the installed Certificate Authority in windows 7/8? Does a TLS interception proxy present the user's browser with the end server's certificate? 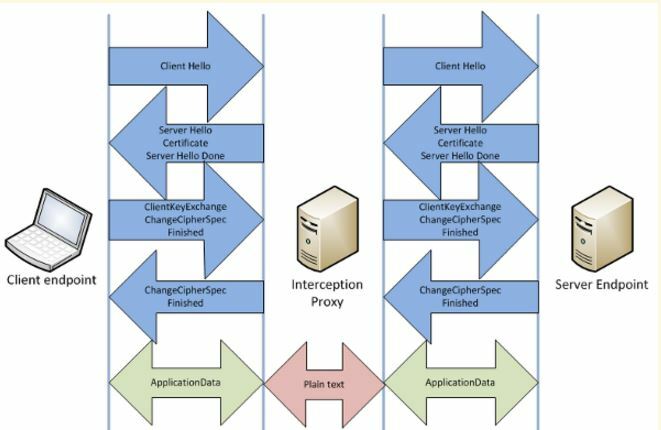 Key Management in Interception Proxies? How does SSL Proxy server in company work? Why/how does Firefox bypass my employer's SSL decryption?